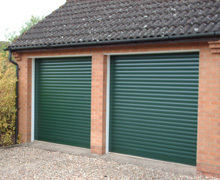 Our manual roller garage doors are purpose-made to any size up to 2300mm in height and 3000mm wide. The door is manually operated with integrated handles located in the middle and at the bottom for convenient operation inside or outside the garage. They have been engineered with ease of use in mind using spring assistance to provide a smooth operation. It is secured by a centrally located lock and key mechanism, is fully CE compliant and comes with a 5 year guarantee. Remember - we are never knowingly beaten on price - if you see a better price for the same manaul roller garage doors showing elsewhere then please ring us - we are confident we can beat any advertised price! A tight coiling curtain design maximises the drive through height of your garage - ideal for larger vehicles such as 4x4s and people carriers. There is no intrusion into any overhead storage space you may have within the garage and does not need the external space for opening that traditional up and over doors require. You can safely park inches from the door. 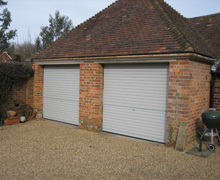 Manual garage doors can only be internally fitted. The slats are high grade corrosion resistant aluminium with a CFC free foam core for thermal insulation and noise reduction, combined with superior guide rails inserts, and bottom slat rubber seals help increase energy efficiency and reduce any heating costs. Each door is made to measure to your individual requirements ensuring a seemless fit with your garage door opening. You can choose from a range of eleven colours as standard, designed to compliment the look of your home. 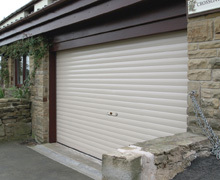 Our garage doors come in a choice of low maintenance finishes as standard. A surcharge applies to guide rails supplied in Anthracite and Metallic Silver, please contact us for details. Our prices are among the most competitive in the business. Select the nearest height and width to our price chart. For sizes in between take the nearest higher price,for example 2150 wide by 2130 high = £762 + VAT. If your size requirements are different to below we can customise to your exact measurements. 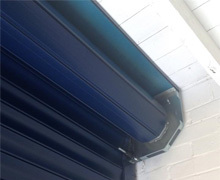 The boxhead requires 205mm headroom inside the garage for doors up to 2150mm, 300mm for doors up to 2500mm opening height and 350mm for doors up to 3500mm opening height. All Guide Rails are 75mm wide. Headroom for top box end plate is 300mm. Supplied as standard with no top box. 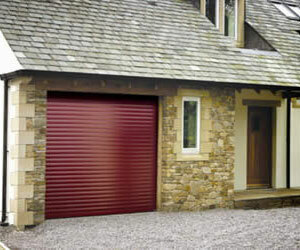 Manual garage doors can only be internally fitted. 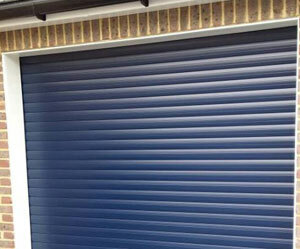 Specialist supplier of insulated manual roller garage doors or automatic roller garage doors for DIY installation or installed for you using UK wide fitting service. First for diy roller garage doors Reading, Birmingham, garage doors Newbury, Oxford, Manchester, Slough, Ascot, Windsor, manual garage doors Maidenhead, Bracknell, manual roller garage doors Wokingham, Guildford and Basingstoke.